Hyundai Tucson Performance, Engine, Ride, Handling | What Car? There are three diesel and two petrol engines to choose from, with the majority of buyers expected to opt for a diesel. There’s an entry-level 114bhp 1.6-litre diesel unit, followed by a 134bhp version of the same engine, which has a 0-62mph time that’s around half a second quicker than its less powerful sibling (but it’s no quicker if you opt for an automatic gearbox). Above those, there’s a 182bhp 2.0-litre engine, which is actually classed as a mild hybrid because it is paired with a small 48V lithium ion battery, and it’s the only one we’ve driven so far in the facelifted Tucson. It’s the quickest diesel engine on offer and provides decent performance that feels quick around town and strong enough for regular motorway use, with a useful amount of low-end shove to help with towing. As for the petrols, you’re likely to have to thrash the 1.6-litre naturally aspirated unit quite hard to make quick progress. There’s also a 1.6-litre turbocharged unit with a lot more power and is the quickest engine in the line-up. We have yet to drive either of these, though. 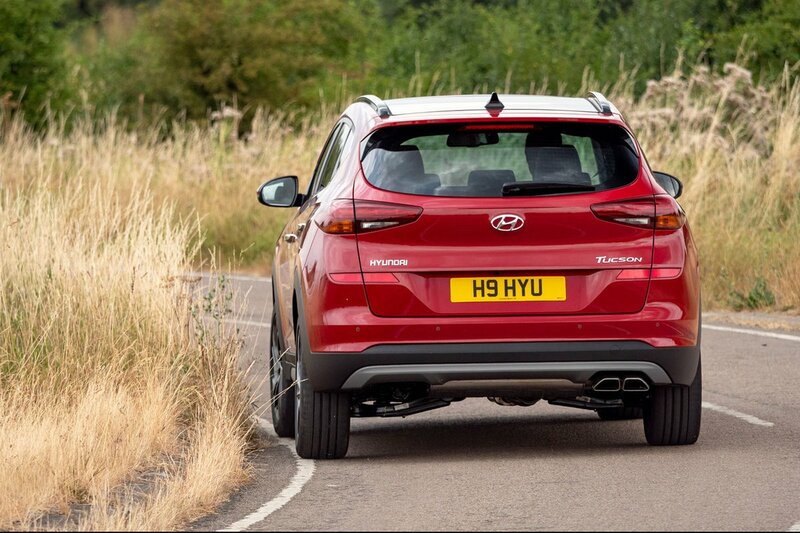 Relatively stiff suspension keeps the Tucson’s body neatly tied down over dips and crests, so your passengers aren’t likely to feel nauseous along undulating country roads. However, the trade-off is a fairly firm ride at low speeds; the Tucson is less forgiving over sharp-edged bumps than, say, a Nissan Qashqai and fidgets around a bit too much, whatever your speed. You can choose from a variety of alloy wheel sizes. The biggest 19in wheels lead to an even rougher ride on poorly surfaced roads, though, so are best avoided. The Tucson doesn't roll much through corners – certainly less than a Qashqai – and there's plenty of grip, even in poor weather conditions. There's little in the way of fun to be had, though, in part due to the steering's slightly vague feel around the straight-ahead position and a shortage of feedback from the front wheels. The steering is light enough to make parking a breeze, however, and weights up enough on the motorway to prevent the Tucson from feeling nervous or twitchy. 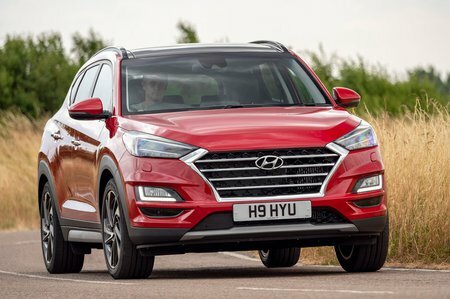 If you go for the 2.0 diesel model, the handling doesn’t feel quite so sharp, because the extra weight of the hybrid system makes the Tucson feel slightly more laboured in its cornering ability, even though it’s quicker in outright acceleration than the other diesels. We suspect the lesser-powered engines will prove marginally better dynamically. We’ve driven only the 2.0 diesel so far in the latest Tucson and it’s nicely hushed at idle and when cruising; however, it does sound very coarse when accelerating and there’s a bit of vibration felt through the steering wheel and pedals. 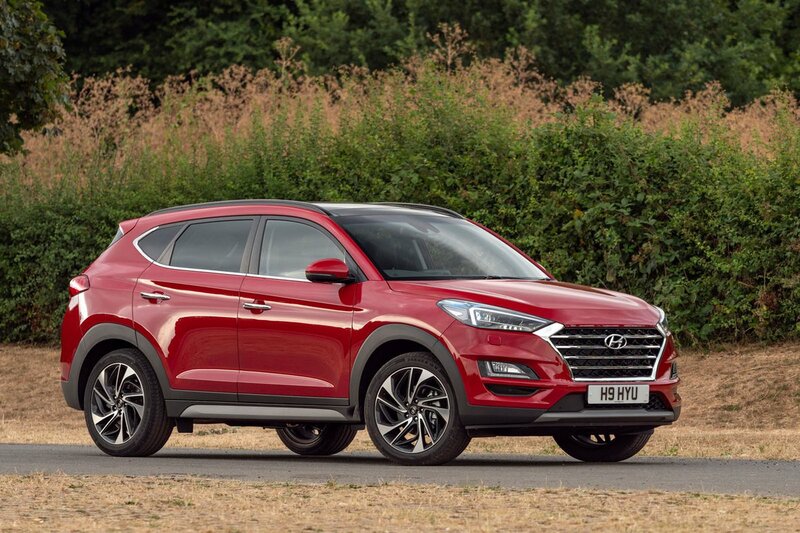 The Tucson’s manual gearbox is light and fairly precise, if a little notchy, while the seven-speed dual-clutch automatic – offered only with the 1.6 T-GDi – shifts quickly but can hang onto gears for too long. You can now get an eight-speed automatic gearbox with the 2.0 diesel that is smooth and slick. That engine also offers an exceptionally smooth stop-start system – a benefit of mild hybrid technology – but the brake pedal, which uses energy from braking to recharge the battery, has a very spongy feel and grabby effect, meaning smooth stops are difficult to judge.